You know how it is. You get to work one day, ready to reheat that leftover soup you were really looking forward to having for lunch, only to find that the microwave’s broken, or someone else is using it. Same goes when it comes to your mid-morning tea or coffee; your co-worker shrugs ruefully at you to tell you the kettle’s out of service. Good thing you bought a new Thermos flask, right? While it’s of course not just good for soup; whether it’s tea, coffee, hot drinks, cold drinks; Thermos flasks are and have been the top dog in the insulation of food and drink since forever. They have a huge range to choose from, so here is our pick of the best insulated flasks to meet your needs. 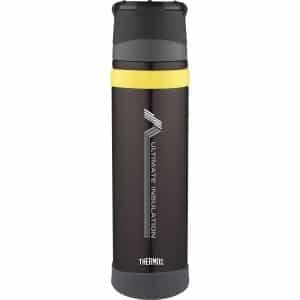 Which Thermos Flask should you go for? Classic Thermos styling meets simple function with this flask. The instantly recognisable shape of the brand’s bottles, in a timeless polished stainless steel finish, really looks the part. The interior is stainless steel as well, ensuring some good durability, but without compromising on weight, tipping the scales at a modest half kilo. As such, it’s plenty portable, with its relatively compact size. In terms of utility, it’s a perfect companion for a chilly day out. An adequate capacity for a good few cups of your beverage of choice, it’s capable of keeping your drinks hot for around 8 hours, but equally maintains cold drinks too, all the way up to 24 hours. The outside won’t get overheated or sweaty though, thanks to the insulating layer, and the lid/cup is insulated too. Built for the rugged outdoors, the King flask boasts a large capacity and durability that makes it ideal for camping or heavier duty use. Available in 7 different colours, it not only looks good but has the function to go with it. Capable of keeping things hot or cold for a full 24 hours, but without this affecting the outside thanks to the stainless steel interior and exterior, it also holds a higher capacity than others. This extra size doesn’t sacrifice portability though, with a useful carry handle (except for the Midnight Blue colour option) on the side. It’s also equipped with an extra-large lid that can double up as both cup or small bowl, and a wider mouth for easier pouring. The provided twist and pour stopper also mean that you can dispense the contents without needing to remove the top. Called the Ultimate for good reason, this flask is built tough. Occupying a more premium end of the price spectrum, it can take being dropped in its stride without compromising the bottle’s integrity thanks to the silicone rings at the top and bottom. It’s also well sealed and insulated, being completely leak-proof and able to keep your drinks hot or cold for 24 hours. Available in stylish matte black or stainless steel, it is compact, slimline and, despite its do-anything rugged build quality, surprisingly lightweight. Therefore, you’ll find it easy to stow in a bag before you whip it out for a piping hot cuppa, which in itself is made easier by the 2-part stopper designed to make pouring smoother. This is the Big Daddy of vacuum sealed flasks, with a massive capacity almost double that of much of the rest of the range. There is still a good degree of portability with a sturdy carry handle on top, even with the extra weight that comes with the increased volume. With this volume, it’s an all-day solution; and it keeps contents hot for around 12 hours, or cold for twice that. As such, it would be right at home in the kitchen, the office, camping trips etc, for a constant and ready supply without the need for frequently re-boiling the kettle. The easy-locking top part is leak-proof, as long as it remains stored upright, the large button on top makes for easy dispensing, so for handy access to hot water (or whatever drink you choose), you can’t go far wrong with this jug. 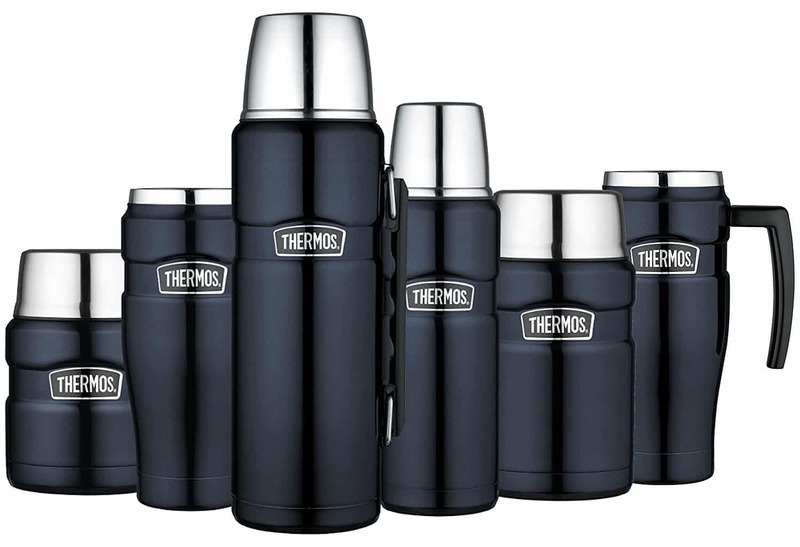 When it comes to a travel tumbler that can stand up to all the ups and downs of a life on the move, look no further than Thermos’ King Travel. Whether you’re a regular international traveller who needs hot drinks on the go or a commuter who’s ready for the wake-up call of caffeine by the time you get to work, the design of this flask is aimed at being convenient for those purposes and more. One of its most distinctly useful travel features is the ability to drink straight from the flask, making it much easier to have a quick swig without the need for cup-lids. The lid locks and seals as well, so there’s no need to worry about leakages while it’s bumping around in a bag. Thanks to the stainless steel interior and exterior, the outside also stays cool/sweat-proof with hot/cold contents – it’ll also keep things hot for 5 hours, and cold for 9. It’s perfect for a simple solution for drinks on the go; lightweight, compact, easy to clean, as well as being available in 7 different colours. It’s called the Direct Drink for good reason, as it has been designed with absolute accessibility at its core. Usable with just one hand, you can open the lid with a quick press of a button and drink straight from it, no cups in sight. The built-in spout aids with comfortable drinking, and you can close and latch the lid to avoid any spillages or accidental openings. 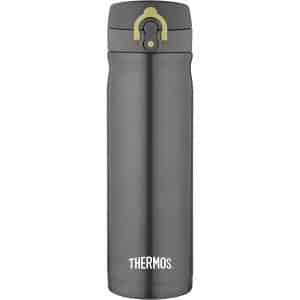 This is one of Thermos’ lightest offerings, but with a good size and capacity makes it ideal for travelling or commuting with. The slim design contributes to this too, and with 4 different colours to pick it looks great to boot. The smaller nature of the drinking spout means that this won’t handle soups or anything thicker, but it nonetheless remains a great choice for most other drinks, keeping things hot for 10 hours and cold for 24. If simple functionality is your thing, and you don’t want to shell out too much on a flask but still get a good product, the Light and Compact is most definitely the choice. 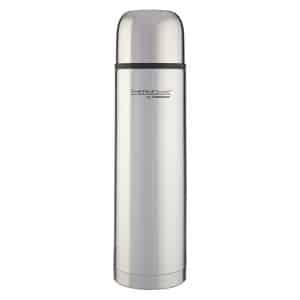 Being positioned towards the budget end of the range has no effect on the quality, with a sturdy stainless steel construction inside and out, the two layers separated by Thermos’ vacuum insulation. The quoted temperature retention time is 12 hours for hot liquids, and 24 for cold. The clue is very much in the name here with regards to portability; it’s among the lightest that the brand has to offer, and is even small enough to fit in a school lunchbox. It also pours effortlessly, with the efficient push-top open/close spout allowing precise pouring without splashing hot water all over the place. Holding enough for a larger-sized mug, or several cups’ worth with the insulated lid/cup that comes with it, it’s a no-nonsense flask that does its job very well. 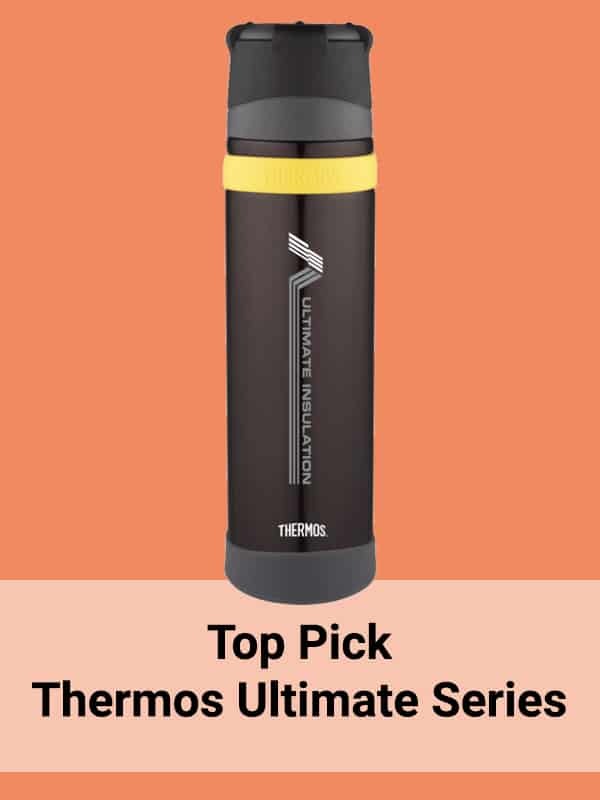 The Work Series flask is among the most durable offering from Thermos, offering a nigh-on indestructible build thanks to double wall insulated stainless steel (which will keep whatever you’re using it for hot or cold for 24 hours) and silicone rings top and bottom. Despite it therefore being one of the company’s heavier products, the robust carry handle on the flask’s side ensures that you can still take it with you without issue. The sealing on the stopper also makes sure that it stays leak-free even on its side, while the stopper itself is a twist-and-pour type. This is so that you can pour without needing to remove the top. Worth noting as well is the matching plus-size cup to go with a plus-size bottle, so whether it’s tea, coffee or soup inside, you’ve got a good capacity cup to enjoy it from. Best quality & features – The Ultimate Series is the best mix of quality build and useful features. While it may come at the higher end of the price spectrum, it’s an investment in a very high-quality product that balances good capacity, fantastic long-term durability and holds temperatures the longest, at a remarkable 24 hours. Reasonably lightweight and compact too, it strikes the best balance between ease of carrying and how much it holds. On a budget – The Light and Compact flask is our recommendation if you’re not looking to pay a fortune for a good-quality flask. It does everything it needs to; good temperature retention, sturdy build, easy use, and it looks smart on top of that. As such, you can’t go far wrong with this one – budget price, but by no means budget features. The lightest option – The Light and Compact is the lightest in the range, weighing less than 300g empty, and not much more than half a kilo even when full. Along with the compact size, you can carry it around with you anywhere and everywhere without it weighing you down. A perfectly simple design well suited for kids’ lunchboxes, or even adult ones too. For camping – Thermos’ Stainless King Flask stands as the best option for camping because of its size and simplicity of use. Despite having a large capacity it’s surprisingly lightweight and not too bulky, which is ideal when trying to pack efficiently for camping trips. Whether you’re out with family, friends or solo, you’ve got a ready supply of water (hot or cold) for 24 hours. It’s also plenty strong enough to handle even the most demanding outings. Reliability – The Work Series 1.2L is the best choice for reliability because of its extra-tough build quality, therefore able to survive the rigours of, well, whatever you throw at it. While the stainless steel construction is something seen across the range, the silicone rings at the top and bottom of the bottle ensure an extra level of protection. The stainless steel interior also ensures that there is no risk of internal damage, compared to a glass-lined flask. Ultimately, you can hope to get years out of this one. 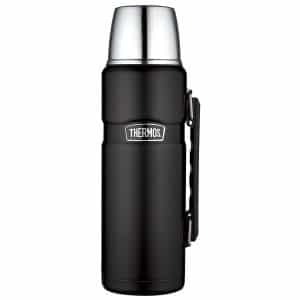 For active lifestyles – The Thermos Direct Drink Flask has to be the go-to for those of you on the go. Whether you’re a city or country hopping traveller, an active commuter or just someone looking for a tough bottle to keep up with you, the Direct Drink’s features tick the boxes. It keeps things hot or cold all day, it’s super easy to pop it open and have a quick drink thanks to the button-activated lid, and it can survive whatever you throw at it leak-free. That comes thanks to the double wall stainless steel build, and the handy latch to keep the lid closed, even when it’s bouncing around in a bag. Before you invest in a Thermos flask, it’s worth taking into account which one is going to be best suited for your lifestyle. Knowing how, where, and how often you’re likely to use it are all key factors; is having ready access to hot tea/coffee (or equally something ice-cold) an all-day requirement? Or, are your drink breaks more sporadic? Is it staying in one place, or does it need to be able to keep up with you in your day-to-day life? Don’t forget to consider who’s using it too, because there are different choices that you can make depending on whether it’s for personal use, or perhaps your family or office at work. Keeping all these elements in mind, read on for some insight into how to choose your ideal flask. With a huge array of differently sized bottles to choose from, it can be hard to know where to start. The smaller products in the collection are naturally far easier to carry around with you; you can easily pop one in a bag, a lunchbox etc, but the trade-off is that they typically come with a lower capacity. As the flasks get bigger, you’re going to find them a little trickier to move about – that said; some larger models do come with carry handles. These ones are therefore not impossible to carry, but you will still need an extra hand. Realistically, a larger one might be better suited to you if you have somewhere to store it; a campsite, a car or van, at home or in the office. 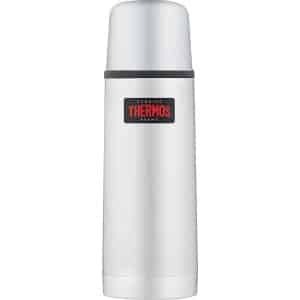 The entire range of Thermos products (barring a few such as the Pump Button Pot) uses a double walled stainless steel construction with a vacuum layer in-between for the insulation of the contents. This means that the temperature retention time is consistently high, but there are nonetheless variances due to the size of the products. Keep in mind too that flasks with a glass interior do have a slightly higher temperature retention time. For peak temperature holding, the larger flasks would be the best choice as they consistently retain their high or low temperatures much longer than the smaller offerings. The smallest flasks do maintain their heat or lack thereof for a good amount of hours, so what it comes down to is; how long is it likely to be before you need to top up the flask? If, for instance, you drink regularly but don’t have easy access to refills, or an infrequent drinker who likes it always at your chosen temperature a larger bottle with a higher retention time will benefit you more. But, that logic, of course, goes the other way; as long as you keep in mind the balance between how often you drink, the time between filing it up and consuming what’s inside, and how easy it is for you to fill up again, you’re all set. The general train of thought is that bigger equals tougher, but that’s not always the case here. 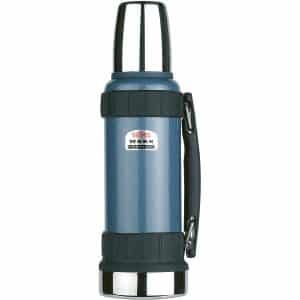 Flasks with an interior and exterior of a material like stainless steel, such as the majority of the Thermos line, are built to last, so even smaller flasks are tough compared to their larger counterparts. You’ll find that the body of the flask will stand up to drops, bumps and dings for a very long time, but be wary of the flasks that come with plastic stoppers – these will be more prone to damage if dropped, so a direct drinking spout versus a screw-top stopper will have different levels of durability. Durability is also increased, even in smaller models, with the inclusion of silicone rings on the shoulders and bottoms of bottles – keep an eye out for that if you want to ensure the toughest outer you can get. On the subject of material, be aware that not all flasks will be stainless steel inside and out. You will also come across some that use a glass interior layer instead of steel, which affects the temperature retention time, but is naturally more fragile. The main point to take away from that is to be careful when it comes to moving glass-lined flasks, as they won’t survive the same drops that a stainless-steel lined one would. The steel is, as the name gives away, rust-proof. Therefore, as long as the flask is cleaned regularly you’re not going to find any problems with maintaining the integrity of the flask. Regular cleaning is certainly one factor that can prolong the usable life of your flask; you run the risk of the flask developing unsavoury smells over time if not cleaned properly. As such, it’s useful to be aware as to whether there are rubber sealing rings inside the lid of your new flask or not; if you don’t get to them during your cleaning process, the general lifespan of the flask will be reduced. Don’t forget that most of these variables are relative to each other; larger flasks will not be quite as portable as the smaller offerings, but may well provide a greater guarantee of toughness and longevity, as well as keeping temperatures consistent for longer. On the other hand, small flasks have the advantage of being easier to carry, but of course, will not hold as much. Whichever flask you decide is right for you, you’re more than likely going to get a good lifespan out of it too. 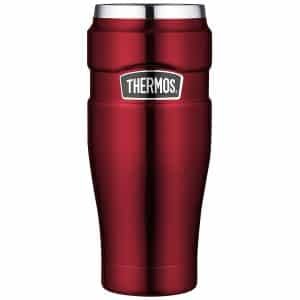 Thermos does offer good warranties on all their products, even with the notable durability of their range. While everyone will be buying a flask for their own particular purpose, with so many to choose from it can be nonetheless a little tricky to know where to start looking. Hopefully, this guide has helped make the outwardly daunting process of choosing just a little bit easier.